Nifty ended 2 points higher at 7,950.9 on Thursday. Although during intraday trade it breached the 8,000 mark for a brief period, but it could not sustain above it. Changes in derivative positions indicate that breaking 8,000 on the upper side is going to be more difficult on Monday. Open interest (outstanding positions) in October Nifty futures increased by 5.7 lakh shares while premium in the Nifty futures shed to 26.05 points compared to 31.45 points earlier; clearly short positions have been added to Nifty future. Similarly in the options segment, 16.9 lakh shares have been added to open interest compared to addition of 8.1 lakh shares in the puts. Open interest in 8,000 calls now stands at 40.7 lakh shares compared to 39.1 lakh shares earlier. Calls of 8,100, 8,200 and 8,300 strikes have also added open interest in the range of 1-6 lakh shares, making the upward journey of Nifty more difficult in the near term. However, 7,800 will act as an support for Nifty as open interest in 7,800 strike put has increased by nearly 3 lakh shares to 38.9 lakh shares. The put-call-ratio (PCR) now stands at 0.91 compared to 0.92 earlier. PCR is a sentiment indicator for the market. A PCR of less than 1 implies overall bearish outlook for the market. India VIX or the volatility index fell 2 per cent to 19.235. In last two trading sessions the volatility index has fallen by nearly 11 per cent, which implies expectations of a rangebound market in the near future. 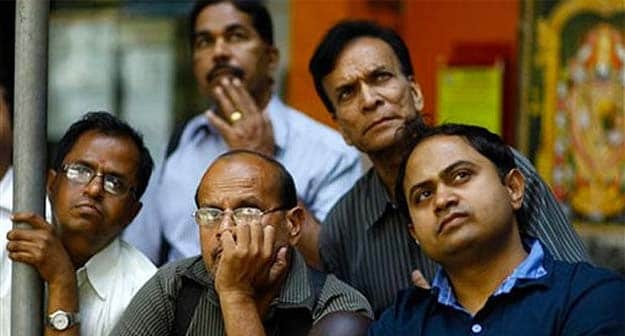 Among individual stocks HCL Tech, Arvind, Allahabad Bank saw addition of bearish bets while Hero MotoCorp, Pidilite Industries futures have also added bearish bets.